South Africa's most recent memory of playing a Test in Port Elizabeth is a pleasant one: in January 2013, they played New Zealand and put together an utterly dominant performance. Batting first, South Africa declared at 525 for 8, with centuries for Hashim Amla, Faf du Plessis and Dean Elgar. When it was New Zealand's turn to bat, Dale Steyn switched on his most hostile self and took 5 for 17 as New Zealand were bundled out in quick time for 121. In the second innings, they fought harder, but could only manage a different combination of the same digits - 211. The result was a hammering by an innings and 193 runs, South Africa's fifth-most comprehensive Test victory (among innings wins). The most recent memory is favourable, but many of the others are not. St George's Park is South Africa's least successful home venue: overall, their win-loss record here is 9-11; since their readmission to Test cricket, it's 5-4, and in the last ten years, it's 1-3. Before that comprehensive win against New Zealand, South Africa had lost their last three Tests here, against West Indies, Pakistan, and England. Australia have a 3-2 win-loss record here, but they've played only once at this ground since 1992. In what turned out to be a highly memorable Test, Australia overturned a first-innings deficit of 101 and went on to chase down a fourth-innings target of 270, with Mark Waugh scoring 116, winning by two wickets. The pitch at St George's Park is traditionally reckoned to be slow, but it hasn't helped the home batsmen score too many runs. In 14 innings between them, AB de Villiers and Graeme Smith haven't once gone past 60. De Villiers has three fifties in seven innings, but hasn't gone on to bigger deeds - his last three knocks here have been 59, 60 and 61. Smith has two fifties in seven tries, but a high of 55. Before Amla's 110 against New Zealand last year, he had scored 58 in four innings at this venue. And the clincher is that even Jacques Kallis, in 19 Test innings here, never scored a century - his highest was 91. Among all the home venues where he played more than one Test, this was the only ground where he didn't score a century, even though he had six fifties. The bowlers have generally had a better time. Steyn has 16 wickets from three Tests and an average of under 25, though in his first two Tests here he only had eight wickets at 41.75. Vernon Philander hasn't played a Test here, but took 6 for 51 in his last first-class match here, against Warriors in 2010. Despite the relatively slow nature of pitches here, fast bowlers have still been pretty successful, averaging 28.32 runs per wicket in the last four Port Elizabeth Tests, since 2004. During the same period, spinners have averaged 31.86. Going further back, South Africa's fast bowlers have done well here. Allan Donald took 40 wickets at 18.20, Shaun Pollock's 37 wickets cost him 20.27 each, while Waqar Younis, Curtly Ambrose, Jason Gillespie and Javagal Srinath had plenty of success in the only Tests they played here. Among the spinners, Paul Adams and Danish Kaneria, wristspinners both, have taken the most wickets, while Shane Warne took 5 for 82 in the only Test he played. In three of the last four Tests here, teams batting first have scored more than 330 in their first innings. The second and third innings here seems to be more difficult for batsmen, with the average runs per wicket dipping into the 20s, both in the last four Tests, and since 1992. 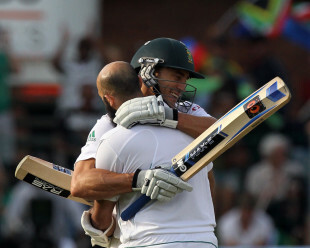 (Click here for the innings-wise scores in Port Elizabeth since 1992.) Three of the last four Tests here have also been won by the team which lost the toss, which could be an interesting one for the two captains when they walk out on Thursday.